According to data obtained by Britannia Rescue under the Freedom of Information Act, the UK's roads are now affected by almost 200,000 potholes, or once for every mile of road in Great Britain. Following a series of colder, more snowy winters than average, the state of our roads had deteriorated rapidly, and local authorities are struggling to keep up. In total, councils have received 32,600 compensation claims in the UK during the past financial year. These range from damaged wheel rims to puncturing tyres and broken suspension as a direct consequence of running on damaged roads. 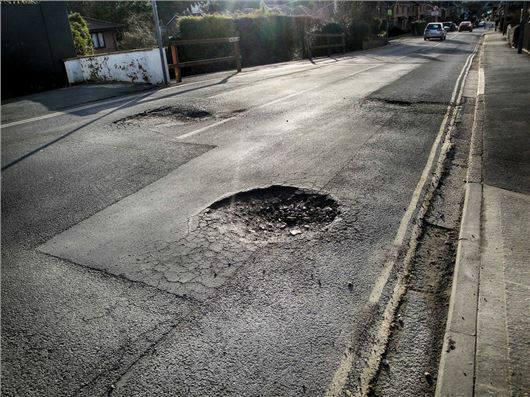 And if you're in Lincolnshire or West Sussex, you're most likely to be affected by pothole damage, judging by the compensation figures, also revealed by Britannia. The shocking rise in complaints about potholes represents an increase of 79% from the previous financial year. This Local authorities in England, Wales and Scotland paid out a total of £2.5m in compensation for pothole or other road damage in the past financial year. "We believe that a proportion of motoring taxes should be ring-fenced for the roads and then that sum that is ring-fenced has to be spent on road maintenance and fixing potholes"
During the past 12 months, 9% of people say their car has been damaged as a result of poor road surfaces with the average repair costing £140. The most common problems are tyre damage (43%), damaged suspension (34%) and damaged wheel rims (26%). The epidemic is down to a lack of funding - less than 10% of the annual road tax bill is spent on road maintenance, leading to a short-term fix culture, with 23% of councils admitting they usually temporarily fix potholes. If repair is 'restore to make good' then very few repairs are carried out, most are just temporary fixes. I'm not an engineer but there was a time when the joint between the existing road and the new surface was sealed with, I think, bitumen and these lasted as the wet was unable to penetrate. This is rarely done these days and despite claims that with new materials it is not necessary this is rarely the case. In Portugal is even worst! All roads havehuge holes and we can discover them even in motorways!! The top ten criteria is wrong! It does not take into account the population of each county or how likely litigation is dependent on how wealthy an area is. There are some truly appalling roads in rural areas and not just potholes! Missing, obscured or worn out white lines. Broken or missing cats eyes. Traffic islands unlit. Street lighting turned off or in need if upgrade. I am actually scared to drive on rural roads at night some urban roads too! Energy saving street lighting is dangerous and makes road markings hard to see!